XHP50 LED UF-P55 2000 Lumens 5 Mode Waterproof Zoomable Camping Flashlight with high quality CREE XHP50 LED, output super bright white light. 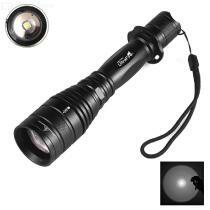 The UF-P55 has an XHP50 LED bead and the UF-P55 has a beam range from 100 to 250 meters. Five different modes (High, Medium, Low, Strobe, SOS (Zoom in and Zoom Out)) enable the UF-P55 to be versatile in a variety of environments.